Good sequels like The Godfather 2 or The Empire Strikes Back continue the story of their predecessors. After an uproariously funny series of misadventures sprinkled among a couple of intensive battles against monstrous deities during The Slayers, the next volume of magical fantasy action comedy anime is appropriately christened Slayers Next. The short-tempered glutton Lina Inverse, the jellyfish-brained swordsman Gourry, the quixotic justice freak Amelia, and the stoic chimera Zelgadis are back craving action, riches, and food. After their victories chronicled in The Slayers, the quartet now seek the Claire Bible - a magical relic briefly mentioned in The Slayers - that is rumored to undo Zelgadis' chimeric body. During this mundane fetch quest, they will inevitably find themselves in various comedic situations and an insidiously developing plot involving their talents. Just like The Slayers, Slayers Next delivers a constant one-two punch of comedy. When they are not poking fun at each other, the characters usually find themselves in bizarre situations such as fishing for dragons, tackling Japanese game show physical challenges, cross-dressing farces, the contractually obligated bathhouse episode, competing in a magical tennis tournament, or taking part in an Iron Chef cooking battle. The humor ranges from overt slapstick to subtle parody that a Japanese pop culture aficionado would spot. Slayers Next does not even pull its punches during the serious episodes focusing on the main plot. Storytelling has vastly improved in Slayers Next. Unlike The Slayers where it felt like two separate but identical plots, Slayers Next consists of a few separate but related incidents leading to one climatic encounter. The incidents within the season are told in short arcs at a fast pace. The fantasy setting is expanded further and gives the anime more depth. Old cities are revisited. Lina and other magic users learn new spells while learning about the mystical forces powering the spells. The Monster race is fleshed out even more as they reveal their plans and politics. Strip away the comedy and Slayers Next features enough mythology and creatures akin to a decent Western fantasy novel. Another welcome addition to Slayers Next is a hint of romance between the main characters. It is a natural development considering the amount of time they spent and the number of near death experiences they faced between comedic banter during the first series It even makes for a touching way to resolve the climatic battle. Fortunately, the romance is not heavy handed since it also serves as comedic material given how dense the romantic interests are during awkward situations usually attributed to romance. Slayers Next adds Martina the constant thorn in Lina's side and Xellos the scheming priest to the cast. Martina adds comedy through her obsessive personality and harebrained schemes against Lina. While not an important addition, giving Lina a rival allows her to shorten her characteristically short temper for more slapstick destruction. Xellos is a key addition to the Slayers Next cast as the manipulative force steering Lina and company. His constant secrets and double dealings keep the viewer glued to the series wondering what he is really planning and when he will execute the plan. Even the comedic filler episodes feel less like filler episodes since they usually conclude as Xellos tricking Lina into doing his political housecleaning. It works in connecting both types of episodes throughout the series. While both language tracks still use the same great voice talents from The Slayers, the English language track for Slayers Next has a couple issues. The English voice actor of Xellos is a grating used car salesman compared to the mellow sounding trickster in the original Japanese. Another English dub issue stems from an episode involving singing: Some Japanese songs are better off with only English subtitles instead of an English dub. The episode does revert to Japanese lyrics in the second verse, but the atrocity of the English verse cannot be undone. One of the best things about Slayers Next is that it stands well as its own series. It uses a few story elements from The Slayers while continuing the series, but even viewers who never watched The Slayers will find enough character development and a standalone story in Slayers Next to comprehend and enjoy. They simply do not make anime like this any more. Bottom Line: Slayers Next fixes the flaws of The Slayers while maintaining the comedic pacing, magical action, and fantasy themed storytelling that made the series such a classic anime. 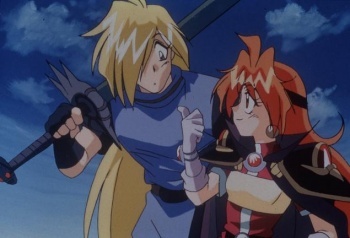 Recommendation: Whether new to Slayers or already familiar with the series, Slayers Next is a comedic gem worth checking out and is a great addition to your anime library. The bonus music video for Otome no Inori (Maiden's Prayer) in Slayers Next is so sugary sweet it gives Tom Tonthat cavities.